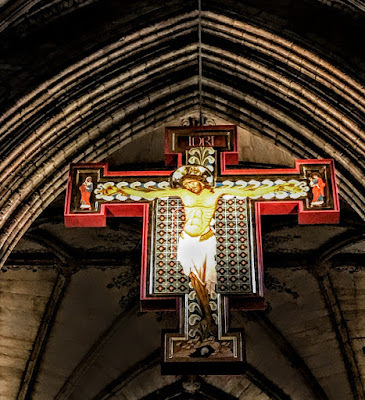 The icon hangs at the east end of the nave, suspended from the roof above the nave altar, and was dedicated by Bishop Michael Ipgrave of Lichfield two months ago on the Feast of the Holy Cross [14 September 2018]. Palestinian icon writers and students from Bethlehem worked on this icon, which completes a triptych of icons in the cathedral. This third icon was planned as the cathedral’s lasting memorial to the centenary of the end of World War I and an invitation for all to appreciate the path through sin, violence and destructiveness that Christ has taken to redeem our evil and win us the everlasting peace and life of God’s Kingdom. The icon measures 3 metres x 2.55 metres and takes its inspiration from the shape of the Saint Chad Cross. The only adaptation is the lengthening and broadening of the central panels. The cross depicts the dying and rising of Christ, the paschal mystery, with two faces. On the west-facing panel, we see Christ nailed to a cross. The cross is blossoming, symbolising the new beginning Christ’s death wins for the world. From his side, water and blood flow, streams of new life. We think of the water of re-birth in baptism and the blood of his body brought to us by the wine of the Eucharist. The east-facing panel depicts the Risen Christ, his face serene, one hand raised in blessing, the other holding the Gospels, the good news he sends out into the world through the Holy Spirit. Work on the icon began in July. A special studio compound was set up in the south transept of the cathedral. Ian Knowles, Principal of the Bethlehem Icon School, brought with him a group of students from Palestine and two of the school’s tutors. The careful painting, gilding and lettering took 10 weeks to complete and the icon was consecrated on 14 September, the feast of the exaltation of the Holy Cross. The Dean first fell in love with the sacred art or icon writing during a sabbatical in the Holy Land in 2012. There he was struck by the sight of nuns regularly saying Friday prayers in front of the icon called Our Lady Who Brings Down Walls painted on the Israeli-built wall that divides Jerusalem from Bethlehem. 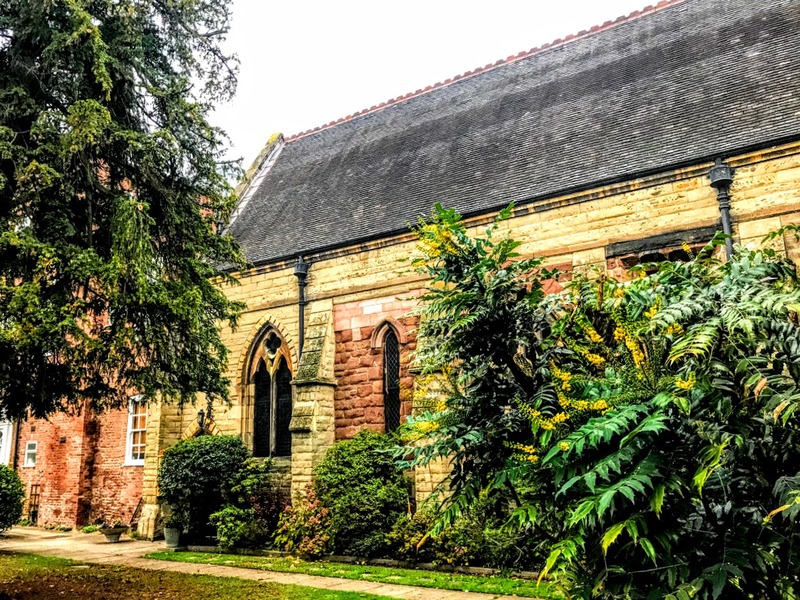 His questions led him to the Bethlehem Icon School and it quickly became been a passion of his to bring the school to Lichfield to create something new for the city and beyond. 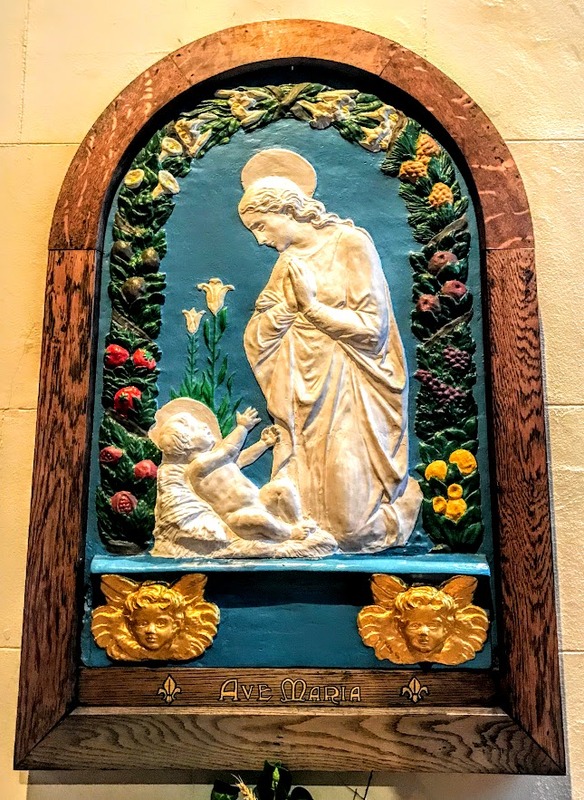 Two years ago , students from the Bethlehem Icon School came to Lichfield to complete the Lichfield Annunciation, two icons of the Archangel Gabriel and the Virgin Mary. 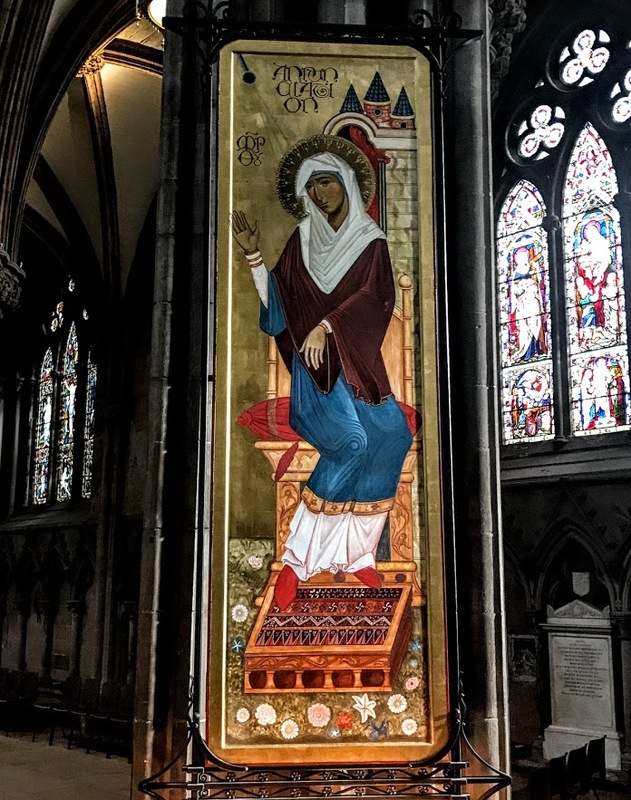 The three Palestinians – Nicola Juha, Noura Sleibi and Loris Matar – worked with the director of the school, Ian Knowles, to produce a pair of icons 270 cm x 72 cm depicting the scene of the Annunciation. 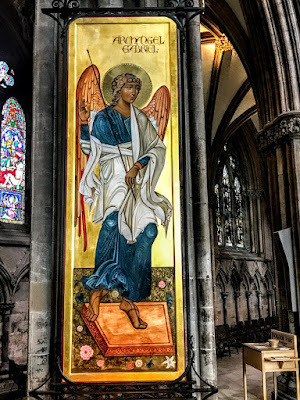 The icon of Archangel Gabriel is based on the Lichfield Angel, a limestone carving discovered during excavation work under the Cathedral floor in 2003. In the paired icon, the Virgin Mary is seated on an elevated throne weaving a cloth that would become the veil of the Holy of the Holies in the Temple. A red curtain stands behind her in the doorway of her house, evoking the veil of the Temple. In this icon, the curtain is drawn back to indicate that the Lord is entering in, making the womb of the Virgin Mary his dwelling place, making her the Mother of God. The icon includes patterns that are indigenous to Palestinian culture. The colourful rug on which the feet of Virgin Mary rest is decorated with Palestinian motifs that are particular to the Bethlehem area. 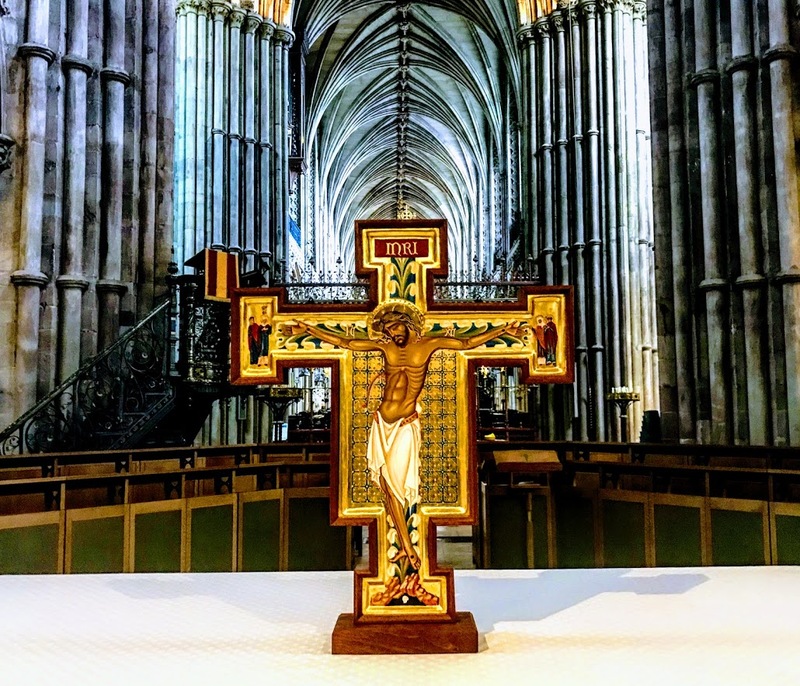 After seven intensive weeks of preparing the boards and writing the icons, they were installed in Lichfield Cathedral, with the Dean presiding at the Eucharist and giving his blessing. 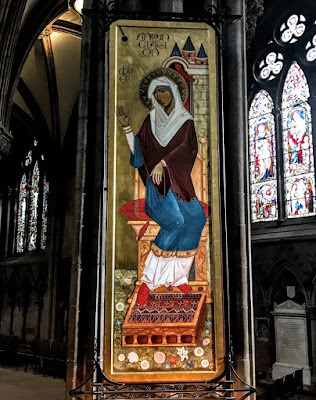 The location of these icons in the cathedral nave has been chosen to enhance the dignity of the altar, to be visible to worshippers during celebrations of the Eucharist and other services, and to be clearly visible to visitors. For the Lichfield Annunciation, two boards were made of tulip wood – 230 cm x 72 cm, and 36 mm thick – with European oak braces. On these, a layer of cotton cloth was attached using animal skin glue, to which was then applied multiple thin layers of a gesso solution made of chalk dust and animal skin glue. This was sanded and then polished, before the design was transferred from sketches made in the studio in Bethlehem. After Armenian bole, a very smooth clay, had been applied to where the image was to be gilded, 23.5 carat gold leaf was applied using a technique called ‘water gilding’. This required working from 9 am until past midnight, for the finest results to be achieved. This was burnished in various ways to give a variety of textures and finishes, all of which reflect light. Gold is used in the icons not to suggest wealth but because it has unique qualities that show a radiant darkness, as though the light is captured and then thrown out again. 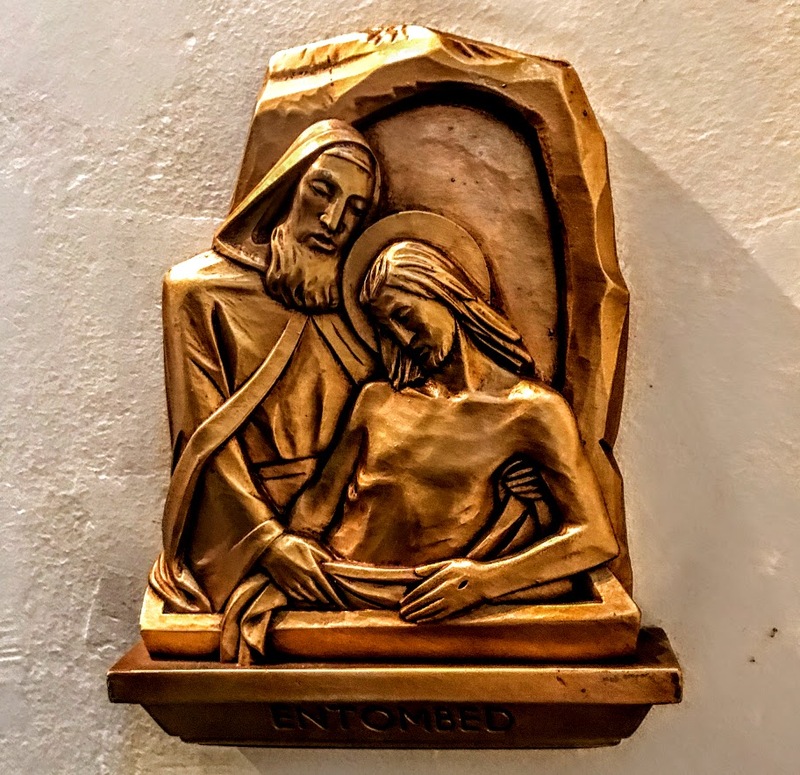 In an icon this symbolises the presence of God, who is both known – the brightness of reflected light, and unknown – the darkness that gold holds in dark browns and greens. The halos were then embossed, the angel’s with rays and the Virgin’s with delicate, radiant patterns. These were created using a rounded stylus and moulded stamps, with sharp taps made by a hammer, that play with the light to create an added beauty. All this follows the techniques of late mediaeval icon writers. The students themselves made the paint. They used egg tempera, the yolk of free-range eggs extracted, diluted slightly with water and a little vodka added as a preservative and to help make mixing with the mineral pigments easier. They used a limited palette of colours, all made from natural sources. Natural pigments are more mellow than synthetic ones, and the location of the icons in a vast edifice of rich coloured sandstone and stained glass would have clashed with more garish synthetic hues. To create a visual harmony and balance, while enabling the colours to ‘sing,’ they kept the palette simple and took particular note of the colours found in the stained-glass windows – in particular the rich yellows from the windows in the Lady Chapel and the greens from the windows in the Nave that nicely complement the red sandstone of the nave walls. 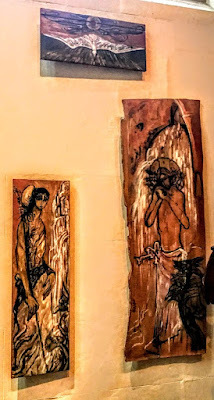 The Bethlehem Icon School was founded in 2010, with a mission to create an environment where Palestinian Christians could meet and reconnect with their centuries-old Christian art. In a city where high unemployment and restricted movement to neighbouring holy sites had become the norm, BIC is working to instil collaborative work ethics, renew spirituality and produce skilled iconographers. Each time I return to Lichfield, I spend some time in the Chapel of Saint John’s Hospital. These are times for prayer, times of pilgrimage and times for giving thanks. 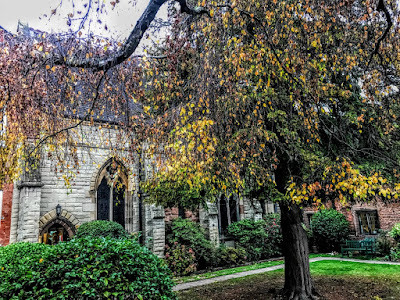 Saint John’s has remained my spiritual home since my experiences there one summer afternoon in 1971. 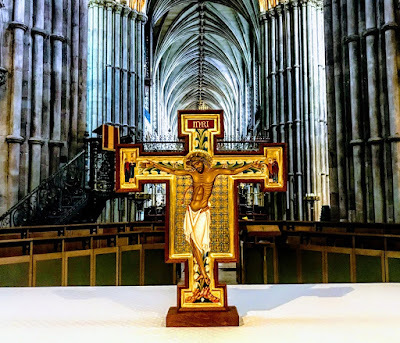 Going on from there to Choral Evensong in Lichfield Cathedral was a combined experience that marks the beginning of my adult faith and a pilgrimage that would lead eventually to my ordination and priesthood. I first arrived in Lichfield in my teens, and I began my career in journalism as a freelance contributor to the local newspaper, the Lichfield Mercury. I continue to be grateful for the encouragement and opportunities provided by the Lichfield Mercury and its then editor, Neil Beddows, in the early 1970s. 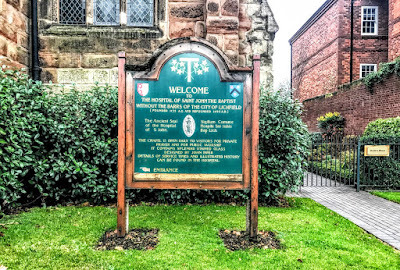 I came to Lichfield following in the footsteps of my great-grandfather, James Comerford (1817-1902), about 70 years earlier. Like him, I was seeking the story of origins of the Comberford family, which was intimately linked with Lichfield for many generations, spanning centuries of the history of the family. Canon Roger Williams when he was the Master of Saint John’s, invited me to preach at the mid-week Eucharist in the chapel on 12 August 2009, the day Jeremy Taylor is remembered in the calendar of the Church of England. 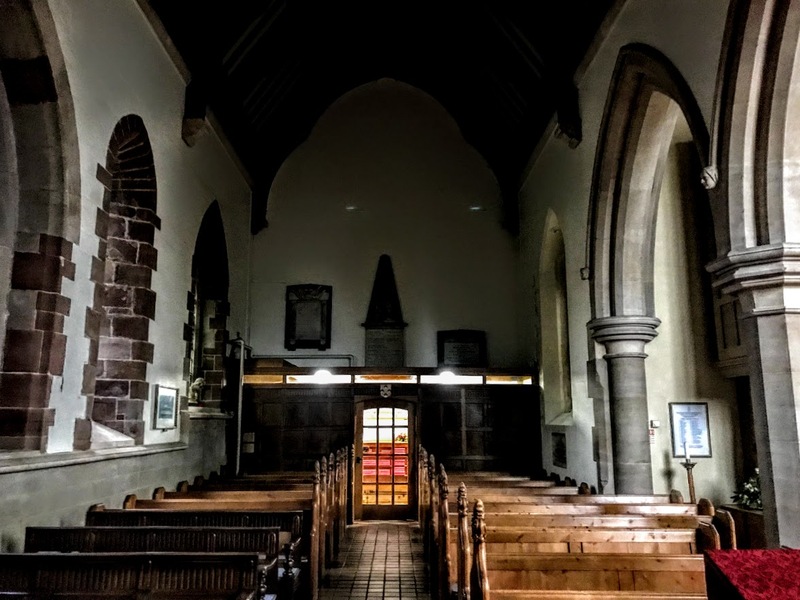 In January 2015, Dave Moore, a local historian who makes films on local people and their memories of local history, filmed five interviews with me in this chapel, asking me about faith and minister, my family connections with Lichfield, my move from journalism to the ordained priesthood, my grandfather’s part in World War I, and my views on war and nationalism. Later that year, on the feast of the Birth of Saint John the Baptist [24 June 2015], I was invited by the 49th Master, Canon Andrew Gorham, to preach at the Festal Eucharist in the Chapel of Saint John’s Hospital. On Friday last [23 November 2018], I attended Morning Prayer in Lichfield Cathedral before breakfast, and then, before leaving Lichfield for a meeting of USPG volunteers in Saint Philip’s Cathedral, Birmingham, I spent a little time in prayer in the Chapel of Saint John’s. 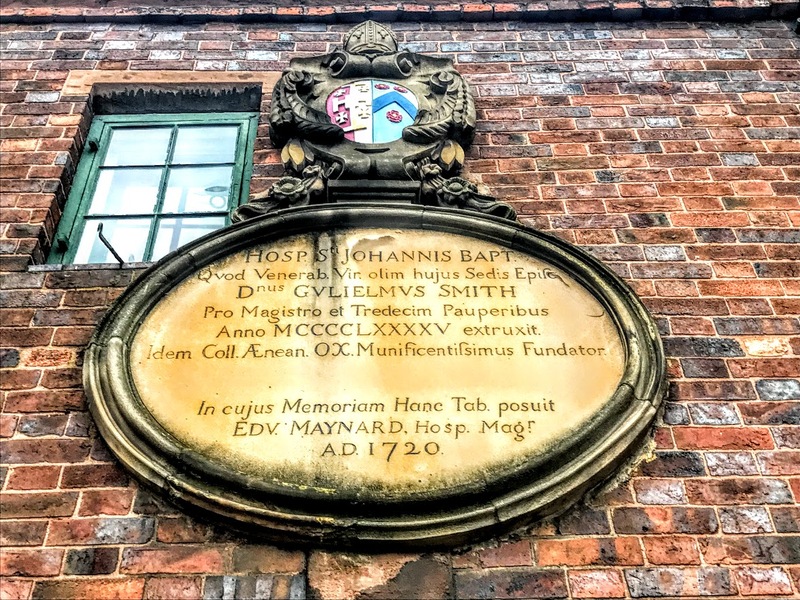 The story of the Hospital of Saint John Baptist Without the Barrs of the City of Lichfield – its formal title – is the story of the important place Lichfield had as a centre of pilgrimage in the Middle Ages. Saint Chad is credited with converting the Kingdom of Mercia in the English Midlands to Christianity. 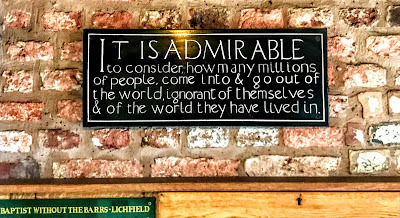 After he died in 672, people claimed miracles at his tomb in Lichfield. 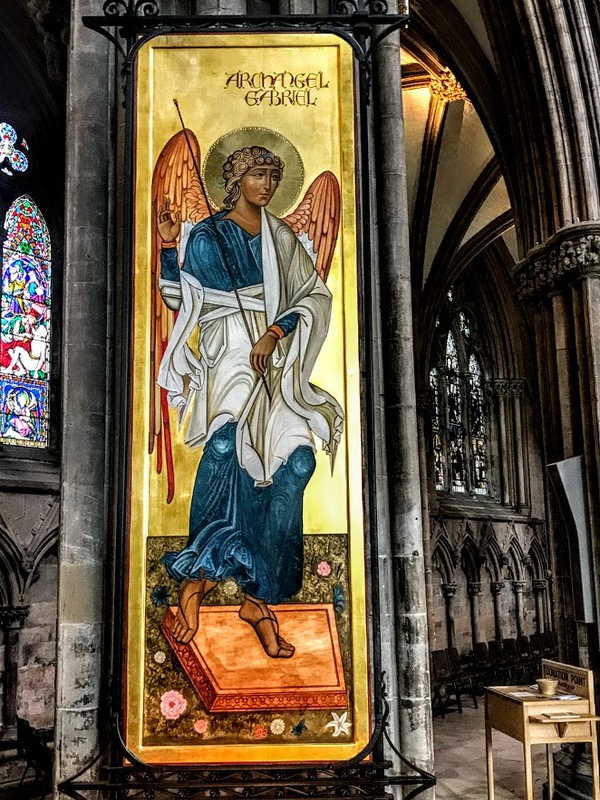 He was declared a saint in 700, and when his body was moved to the new cathedral in Lichfield, his shrine became a popular place of pilgrimage. The mediaeval cathedral stood inside a fortified close, protected by a defensive ditch, rampart and expanse of water. The city was enclosed and the four gates or ‘barrs’ were closed at night and did not open again until the morning. Pilgrims who arrived late in the day found their entry was barred, and they were left outside for the night without shelter. 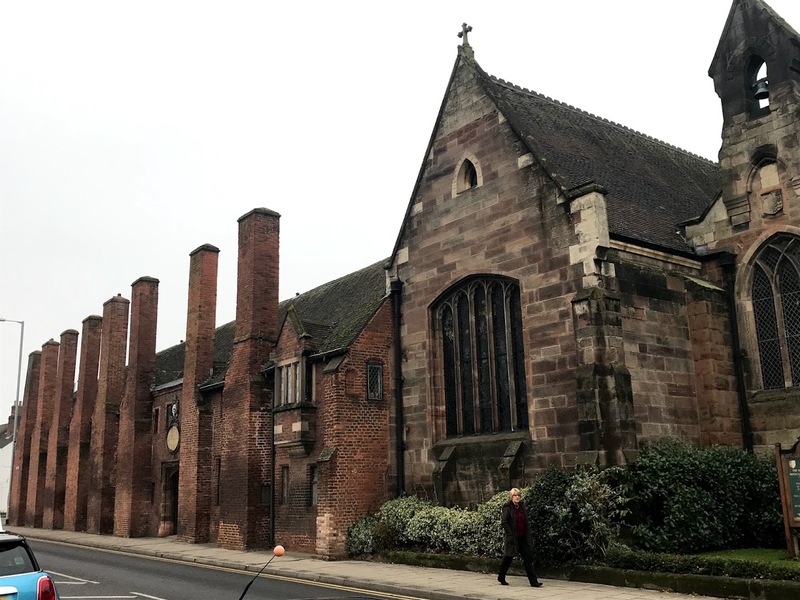 To meet their needs, Roger de Clinton, Bishop of Lichfield (1129-1148), built an Augustinian priory just outside the Culstrubbe Gate, where the road from London arrived at the south side of Lichfield. The priory was completed in 1135 and the house became known as the Hospital of Saint John Baptist without the Barrs. The Augustinian canons or friars were expected to provide food and shelter for travellers arriving late at night. The hospital chapel, as well as serving the hospital community, was a place of public worship from at least the earlier 13th century. Elaborate precautions, however, were taken to protect the rights of Saint Michael’s Church, in whose parish the hospital stood. By an agreement made in Bishop Stavensby’s time (1224-1238) with the Prebendary of Freeford, the prior and brethren of the hospital and their chaplains promised to maintain the rights of the prebend, to which Saint Michael's was appropriated. 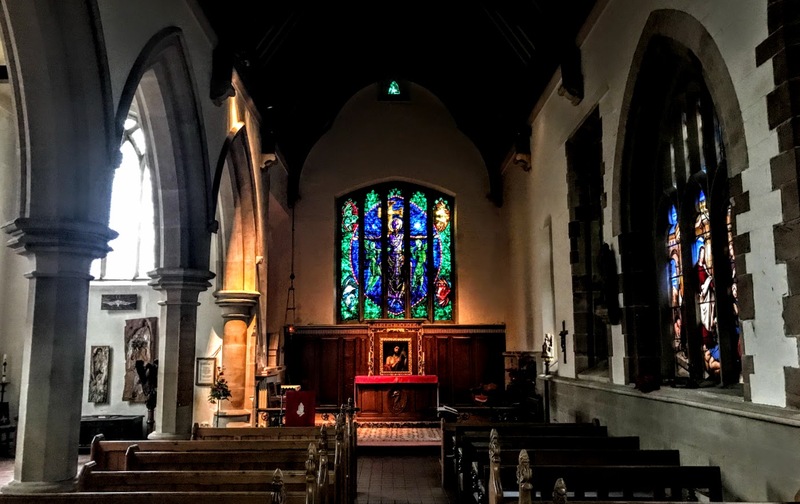 In return for these promises, the Prebendary of Freeford allowed the establishment of a chantry in the hospital chapel. When the dissolution of the monasteries began 40 years later in 1536, the changes made by Bishop William Smyth a generation earlier ensured the survival of Saint John’s as a hospital or almshouse and as a school. 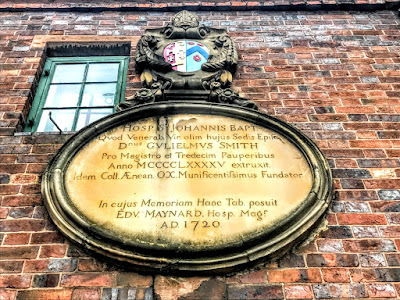 The grammar school was separated from the hospital in 1692, but the school continued to use the chapel, and the schoolboys included local worthies such as Joseph Addison, Elias Ashmole, Samuel Johnson and David Garrick. 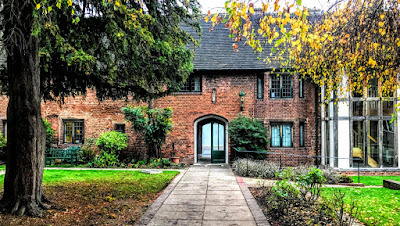 Edward Maynard rebuilt the Master’s Hall once again in 1720 to keep up with modern Georgian architectural tastes, and the stone tablet above the doorway dates from this period. By the early 19th century, Saint John’s must have had the character and the problems described by Anthony Trollope in his novels, including The Warden and Barchester Towers. A north aisle was added to the chapel in 1829, and a new three-bay arcade was built. In another major restoration in 1870-1871, the Master of Saint John’s, Philip Hayman Dod (1810-1883), repaired and renovated the chapel, raising the walls of the nave, building a new roof, and adding buttresses outside and a stone bell-cote and bell. The Rev Denham Rowe Norman was the last master to govern the hospital and administer its estates under the statutes of 1495. 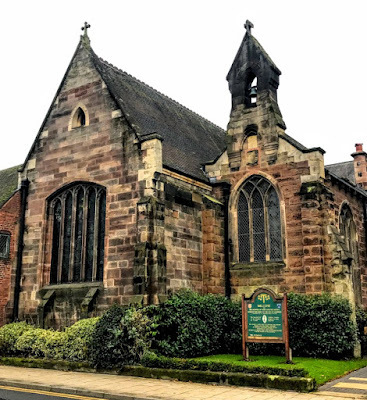 When he tendered his resignation to the Bishop of Lichfield in 1925, he had been in orders for 70 years and was one of the oldest clergymen in England. 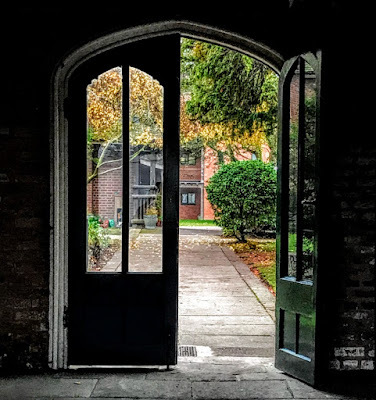 The almsmen’s rooms at Saint John’s were rearranged in 1929 to overlook the court or quadrangle, giving them more light and modern heating and sanitation. 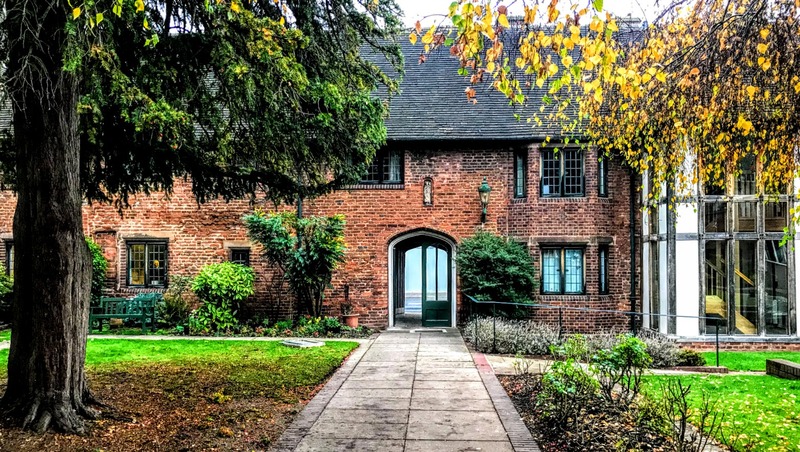 The Master’s House was renovated in 1958, new flats were added in the mid-1960s, and the inner quadrangle was completed with a new building. In the 1960s too, for the first time, married couples were allowed to take residence in the hospital. When Lichfield Theological College in the Cathedral Close closed in 1976, new accommodation was provided in what became the Hospital of Saint John’s within the Close. The Chapel has a single-vessel nave and sanctuary, with a north aisle that was added in 1829. At the east end there is a coped gable with kneelers and offset angle buttresses to the right. There is a segmental-pointed window of five double-cusped lights, a small window with a pointed arch above, and an enriched 19th century rainwater head to the left. The blind return has a cornice. The exterior of the north aisle has a coped west gable with kneelers, a gabled bell cote, and angle buttresses. 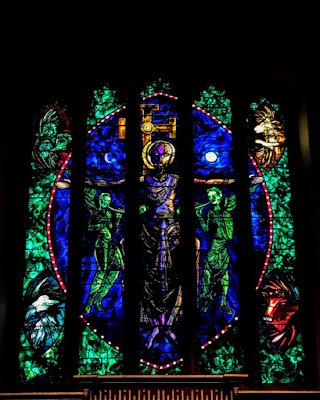 The three-light west window has intersecting tracery. The north return has similar windows flanking the buttress and stack. The south elevation of the chapel has offset buttresses, and a double-chamfered pointed entrance to left end; a two-light plate tracery window, a lancet, a three-light window and a two-light square-headed window, both with Perpendicular tracery, and a traceried lancet at the right end. Inside, the chapel roof has cusped arch braces to the collars and queen struts. The sanctuary has a blocked thee-light square-headed window on the northside. The three-bay arcade at the north aisle has octagonal piers and head stops to the hoods. The north aisle has a kingpost roof. 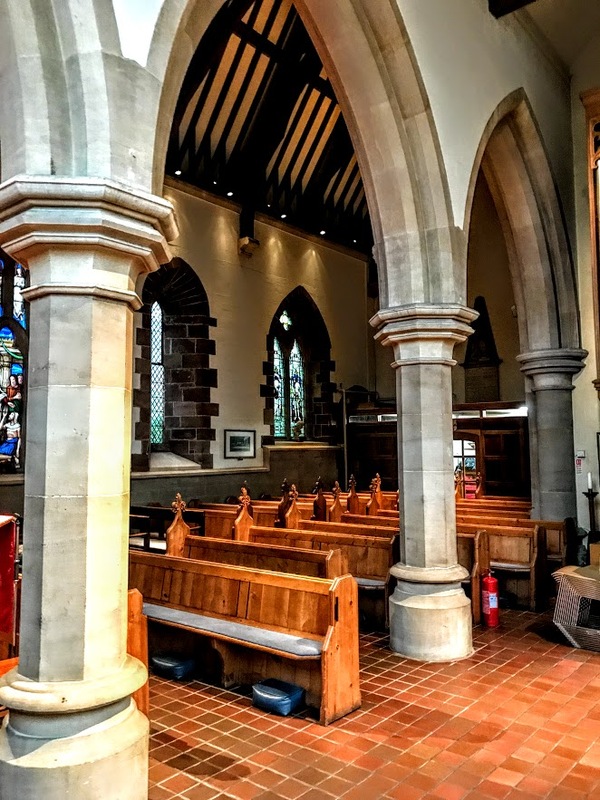 The sanctuary has bolection-moulded fielded panelling, a fluted frieze and cornice, a large central panel with a frieze with grapes and wheat, a piscina on the south with an arch over the restored bowl, a gabled tabernacle and encaustic tiles. The west end has a vestibule with re-used panelling, and there are monuments to members of the Simpson family at the west end. 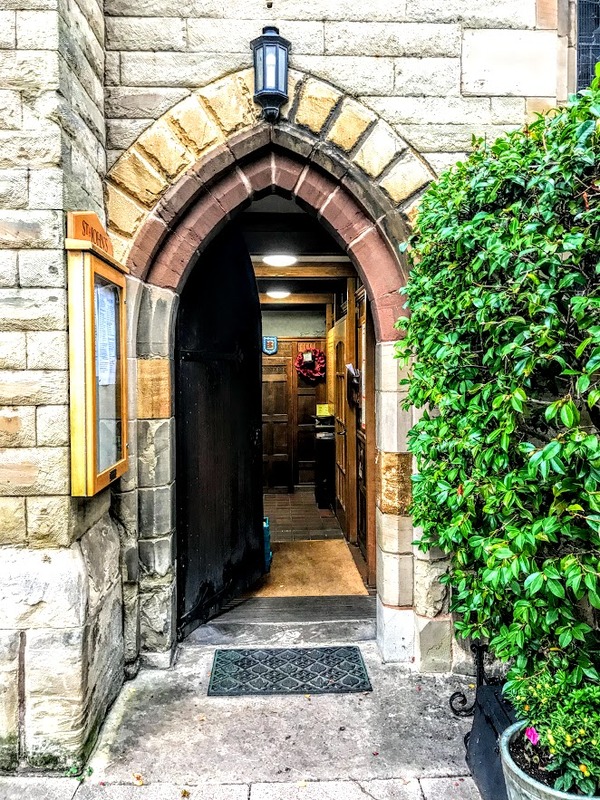 Entering the chapel at the west end, there are two facing windows of similar style by the Victorian stained-glass designer and manufacturer Charles Eamer Kempe (1837-1907). 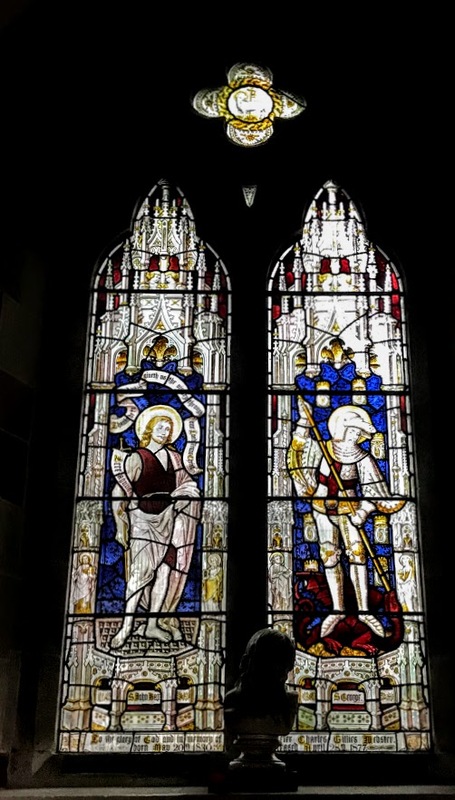 Kempe was best known in the late Victorian period for his stained-glass windows, some of which can also be seen in Lichfield Cathedral. The Cambridge Church Historian Owen Chadwick, who died in 2015, once said Kempe’s work represents ‘the Victorian zenith’ of church decoration and stained glass windows. 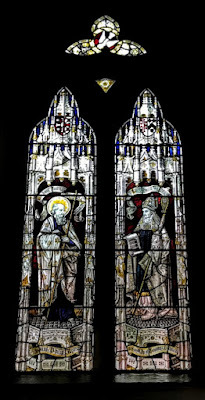 One Kempe window, portraying Saint John the Baptist and Saint George the Martyr is memory of Captain Peter Charles Gillies Webster (1836-1877), Adjutant of the Staffordshire Yeomanry. The facing window, portraying Saint Philip the Apostle and Bishop William Smyth, commemorates Philip Wayman Dod (1810-1883), who was the Master of Saint John’s (1842-1883) and undertook the repair and arrangement of the chapel in 1871. Above Saint Philip is the coat-of-arms of the Bishops of Lichfield; above Bishop Smyth is his coat-of-arms as Bishop of Lichfield. Around Saint Philip’s head, a scroll reads: ‘We have found Jesus of Nazareth’ (see John 1: 45). Bishop Smyth is holding a crozier with his left hand and in his right hand he holds an illustration of the chapel. Above him, the words on a scroll read: ‘Except the Lord build the house’ (Psalm 127: 1). A two-light window, ‘Suffer the Little Children’ is in memory of Catherine Browne (1813-1880) of The Friary, Lichfield, a local doctor’s wife. 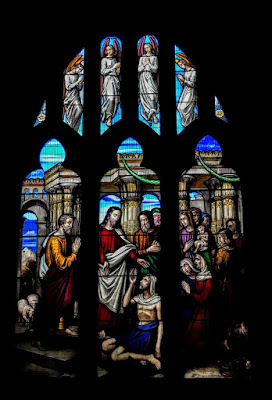 The Biblical text in the lower window reads: ‘Suffer the little children to come unto me and forbid them not for of such is the kingdom of God’ (see Matthew 19: 14; Luke 18: 16; Mark 10; 14). The large window on the south wall is the earliest stained-glass in the chapel and dates from ca 1855. It depicts Christ healing the crippled man at the pool of Bethesda (John 5: 1-16). 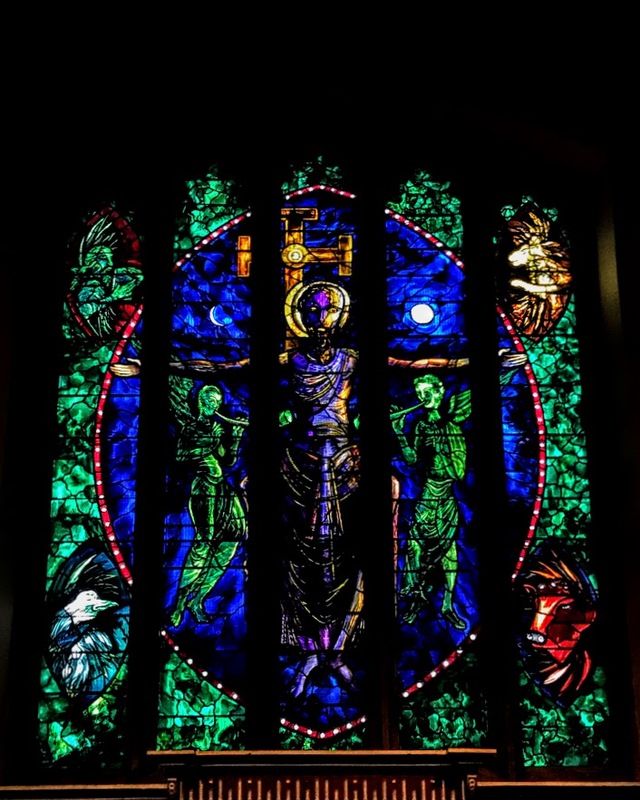 John Piper’s magnificent stained-glass window depicting ‘Christ in Majesty’, executed by Patrick Reyntiens, was placed in the east window of the chapel in 1984. This is a work of great solemnity and power in strong colours, and is John Piper’s last major undertaking. It shows Christ in Majesty, with the Mercian cross offset, and surrounded by the symbols of the Four Evangelists: Saint Matthew (man), Saint Mark (winged lion), Saint Luke (bull) and Saint John (eagle). The design was influenced by Piper’s drawings of Romanesque sculptures in the Dordogne and Saintonge areas in western France in 1955-1975. 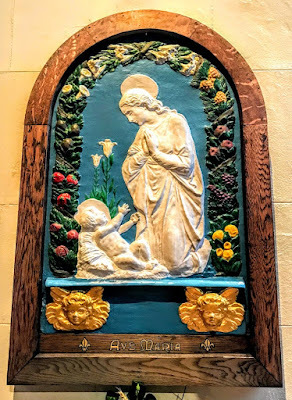 In the north aisle, the shrine of the Blessed Virgin Mary is in the style of the Italian ceramicist Lucca della Robbia. There are 14 Stations of the Cross along the north wall. A Triptych of wooden plaques (1999) depicting the Baptism of Christ by Saint John the Baptist is on the east wall of the north aisle. This is the work of a nun. 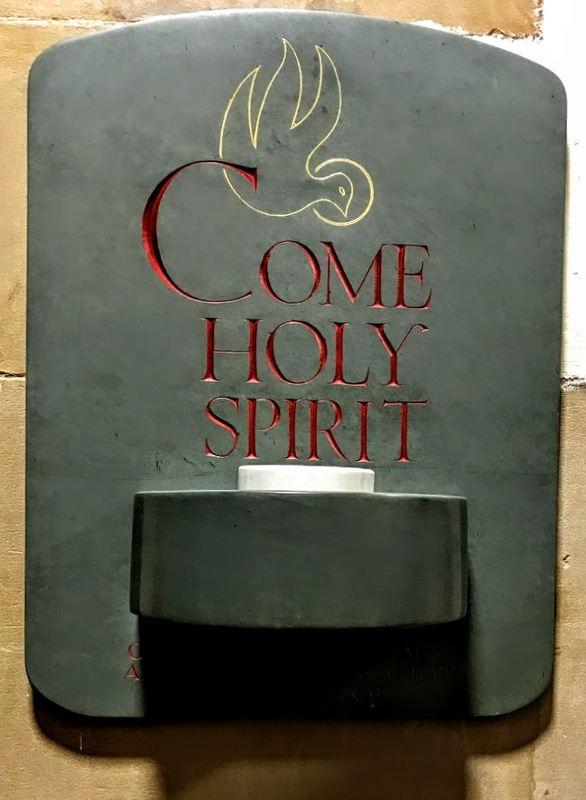 The octagonal Baptism font is also placed in the north aisle. 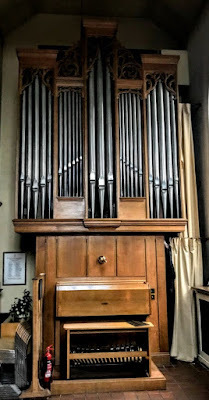 At the west end of the north aisle, the organ (1972) is by Hill, Norman and Beard. 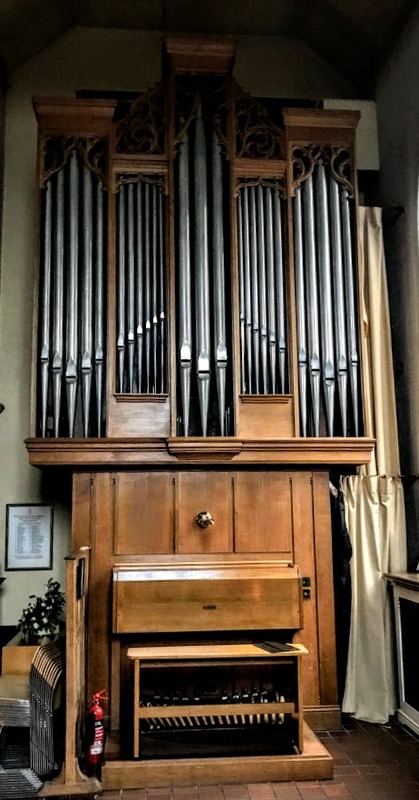 Beside the organ is a framed list of the Priors, Master or Wardens of Saint John’s from 1257. Since the Tractarian Revival, the Chapel of Saint John’s has stood in the Catholic tradition of the Church of England. The chapel continues to provide daily and weekly services, and regularly draws a congregation of residents and visitors, offering a daily and weekly round of services from Common Worship, under the direction of the Master, the Revd Helen Maria Barton. 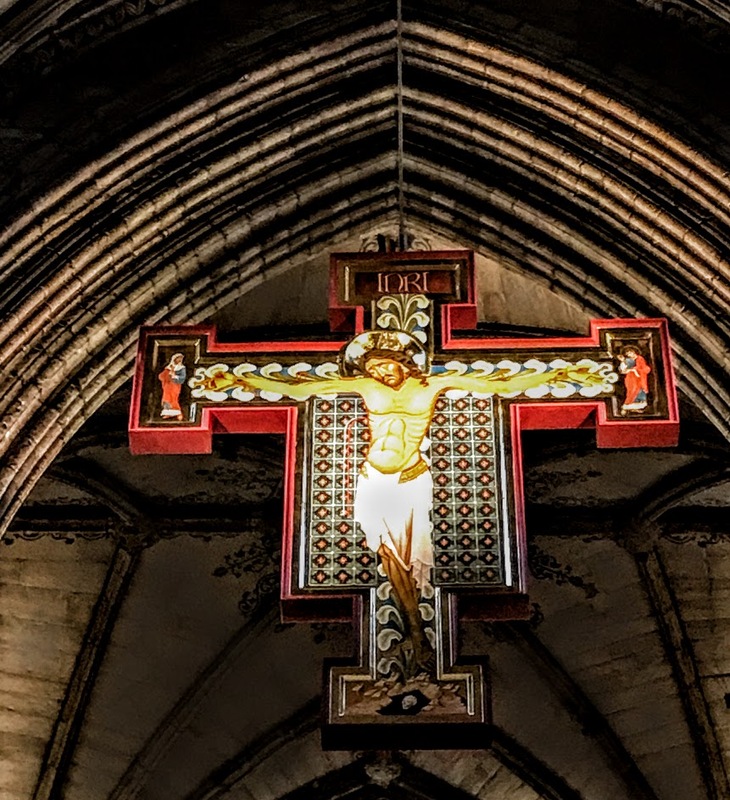 There is a Said Eucharist every Sunday (8.30) and Wednesday (9.15), the Eucharist with hymns on Sundays at 10 a.m., a Solemn Eucharist on the First Sunday of the Month (10 a.m.), Founders’ Prayers at 9 a.m. from Monday to Friday, as well as baptisms, weddings, and funerals. At the beginning of this century, the original 1495 east wing of Saint John’s was renovated, enlarged and updated. The hospital façade of this east wing faces Saint John Street has eight large projecting stacks with offsets, and an offset buttress to right end. The entrance, between the sixth and seventh stacks has a Tudor head in an architrave, with a label mould battened door with strap hinges. The oval plaque above, erected in 1720, records the re-founding of the hospital in 1495, and a cartouche above bears the heraldic arms of Bishop William Smyth. 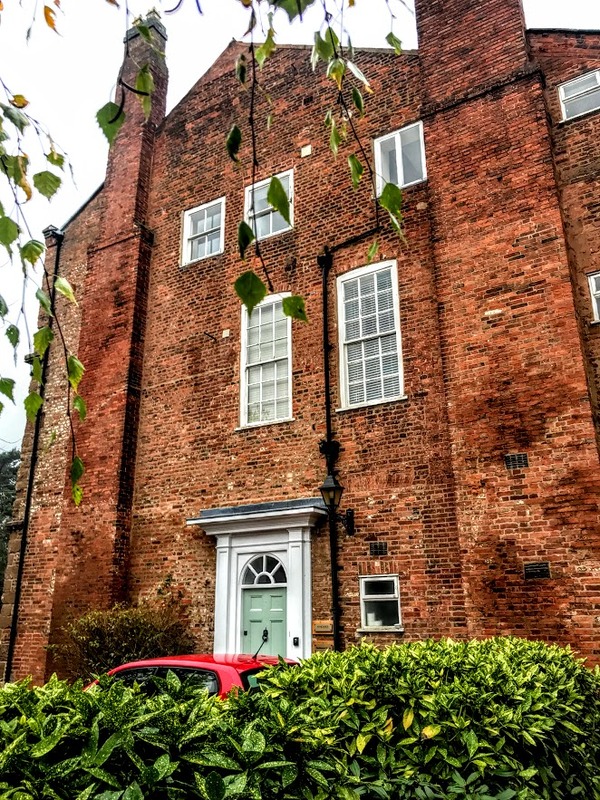 Most of the windows on this façade are small, with brick sills, chamfered jambs and ashlar lintels, and leaded glazing. 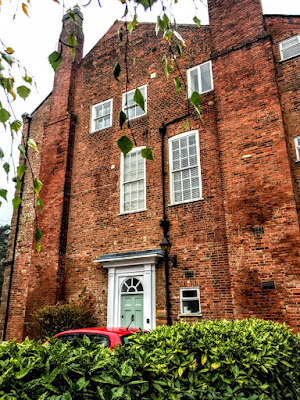 There is a larger window to the left of the cartouche, the windows to the right of entrance are larger, where the window on the ground floor has a brick label, while that on the first floor has a two-light casement with small-paned glazing. The right end has two small windows on the ground floor and a later gabled oriel above, with a 1:3:1-light single-chamfered-mullioned window. The right return next to the chapel has a blocked elliptical-headed window and leaded light. The left end has 1929 additions forming a canted angle and wing to the rear, additions from 1966 of a single-storey return wing and a two-storey rear wing. The rear elevation has a four-centred entrance to a cross-passage with a brick arch and niche above with a 19th century statue of Saint John the Baptist. There are two-light, three-light and single-light windows to the left; to the right are six two-storey canted bays of 1929 with 1:2:1-light windows. In recent years, 18 new apartments have been built at Saint John’s without the Barrs. The project was delayed when 50 mediaeval skeletal remains – adults and children alike – were found in shallow graves. Their remains may help archaeologists learn more about the lives, times and habits of mediaeval pilgrims. A sculpture of ‘Noah and the Dove’ by Simon Manby was commissioned by the trustees in 2006 and stands in the quadrangle. 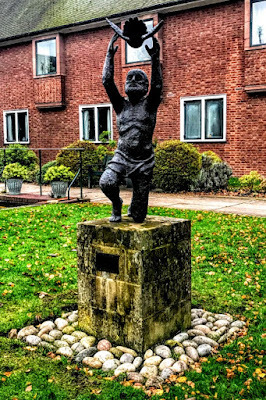 Manby created this statue in his studio in the Weaver Hills in north Staffordshire. It shows the dove returning to Noah with a fresh olive branch at the end of the flood. With its distinctive row of eight Tudor chimneys fronting Saint John Street, Saint John’s Hospital remains a living landmark in Lichfield, and the grounds remain an oasis of peace and calm in the heart of the cathedral city.